Emerging from a somewhat awkward downward dog position, I glanced past my yoga instructor and classmates to check out the rising sun over the Sonoran Desert. As the subtle orange light brightened, the previously silhouetted cacti came into view and my yoga awkwardness faded away. I was at peace with the world and I discovered I wasn’t as bad at yoga as I previously thought. Southwestern Arizona is a place of unique discoveries—even beyond my yoga realization. Every town has a story, outdoor recreation is abundant, cacti are celebrated, Native American culture is revered, and you’ll even find a town named Why—and, no, I don’t know why. Here are some of the highlights from my road trip through this desert landscape. Once a thriving copper mining town, Ajo was left with a gaping hole at the heart of the community when the mine closed in 1985. Residents moved away in search of employment, businesses and schools closed, and life was bleak. But Ajo has found new life and is emerging as a haven for artists. Strolling through the town plaza, Spanish Colonial Revival architecture reigns. The focus on art is evident everywhere but especially in Art Alley where murals share political, cultural and borderland viewpoints in vibrant colors. Art is also the focus at the former Curley School where resident artists create and showcase their work. Former classrooms at the school have been beautifully transformed into lodging as The Sonoran Inn and Conference Center. The property’s Southwest industrial design focuses on color as well as preservation of elements from the property’s history such as 8-foot ceilings which provide generous natural lighting. The inn promotes sustainability with the Ajo Center for Sustainable Agriculture vegetable garden, fruit orchard and “green” chicken coop. The 1,100-foot-deep hole that was formerly New Cornelia Copper Mine has also taken on new life as an attraction for visitors. A drive up to the Mine Overlook provides a view into this enormous pit and an opportunity to learn more about Ajo’s history. 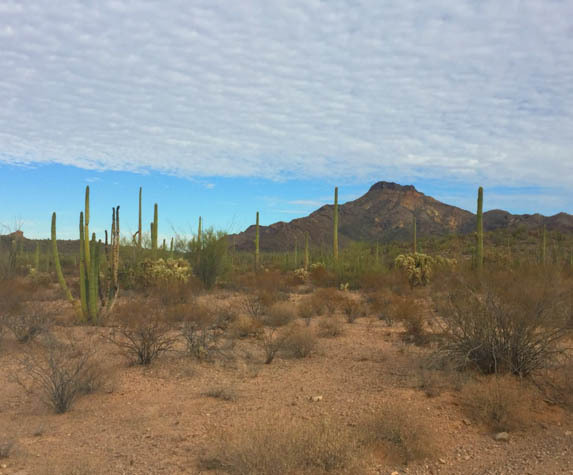 Ajo may be a small town, but it has a huge backyard in the form of more than 12 million acres of undeveloped Sonoran Desert. Hiking, biking and camping are popular pastimes as well as the previously mentioned sunrise yoga—which I highly recommend. Did you know the stately single trunk saguaro cactus doesn’t grow its first arm until it reaches 95 to 100 years old? In contrast, the Organ Pipe cactus’ numerous slender arms make it clear how this species earned its moniker. Discover these and 26 other species of cactus within the Organ Pipe National Monument. The park preserves 500 square miles of a stunning desert landscape. Get a glimpse of it all on the Ajo Mountain Drive. This 21-mile one-way loop puts some of the park’s best scenery on display. The gravel road climbs from the valley floor into the foothills of the Ajo Mountains skirting past towering walls of cliffs and sculpted canyons. Seasonal ranger led walks are an excellent way to learn more about these fascinating plants and all the living things within the boundaries of the monument. If you’re up for more adventure, take a guided night walk to witness all that comes to life after dark in the desert. For thousands of years, the Tohono O’odham nation inhabited an enormous portion of land in the Southwest known as Papagueria. Today that land has been significantly reduced and is now divided between the US and Mexico. The elders of the tribe are passionate about their nation’s history and are striving to convey that passion to the younger generations while educating visitors in the Tohono O’odham Nation Cultural Center and Museum. Diverse cultural programming and exhibits delve into the history and customs of this great nation. In the border town of Sasabe (population 9) the Rancho de la Osa celebrates the region’s ranching heritage. The ranch was part of the 1812 Ortiz Brother’s Spanish land grant. Through its long and complicated history, the ranch has been part of Mexico and survived an attempted takeover by Pancho Villa in 1916. A cannon ball from that attack is on display today at the hacienda. Rancho de la Osa has served as a vacation destination for celebrities and politicians for decades. William Clayton wrote the Marshall Plan in what is now known as the “Clayton House.” Margaret Mitchell, John Wayne, Joan Crawford, President Lyndon Johnson and his wife, Ladybird, are also among its long list of notable guests. The ranch is adjacent to nearly 120,000 acres of the Buenos Aires Wildlife Refuge. It’s a birdwatcher’s paradise with more than 300 species including herons, Golden Eagles and the endangered Masked Bobwhite Quail. Activities are abundant and include biking, horseback riding, hiking and wildlife photography. Take an ATV ride along the Mexico border or try your hand at clay pigeon shooting. Farm to table dining in the main house and an abundance of cowboy stories add to the highlights. Have you discovered the nature and culture of Southwest Arizona? Keep up with the latest travel news, stories and updates and sign up for our newsletter today!